As a stay at home mom, my day is basically running errands, going to the playground, cooking and procrastinating about cleaning. I spend a lot of time in comfortable, casual clothes. As we transition into spring (effin cold in Chicago), I'm finding that my closet hasn't quite caught on to this style. Are cowboy boots appropriate for walking to the grocery store? Nope! By the time I got home, my feet were killing me. Lugging groceries require proper footwear. It's nice to have folks stop and tell me how cute the boots are. Note to self: more colored cowboy boots for winter. It's time to find a comfort shoe. My quest this summer is to find a cute and cushioned non frumpy flat shoe that better suits my SAHM life. I love the Anthropologie sweater given to me by my friend. It's one of my favorite finds from someone else's closet. It's perfect to wear with leggings. It dips down far enough to cover crotch area. It can be wrapped and belted too. Sleeves move up and down. It's total grandpa chic-dom. (awesome made up word). Underneath the sweater is the bare minimum of casual dress -- a tee and leggings. 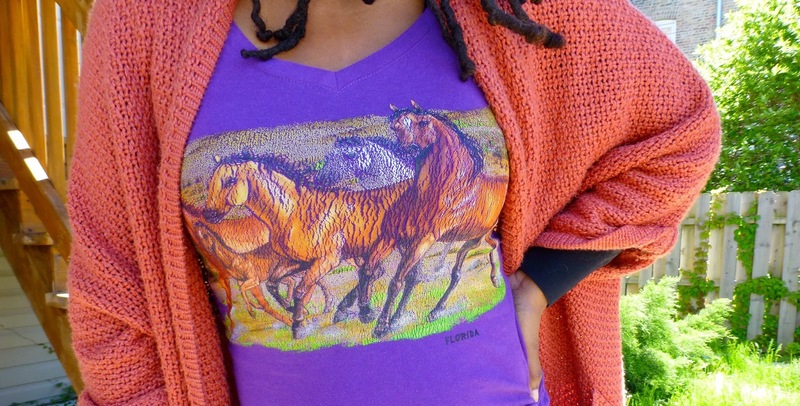 Horses are on my t-shirt and that makes me happy. I think it was new when I thrifted it. I found it in the kids section so when I pulled it on over my non kid chest the horses went running in all different directions creating a cozy vintage look. Yes, I'm doing the leggings thing again. I have flopped on the pants as leggings issue. Elastic waist is just too much for me to resist. Even with pockets, these leggings made me feel slightly pantless. Womp. Womp. 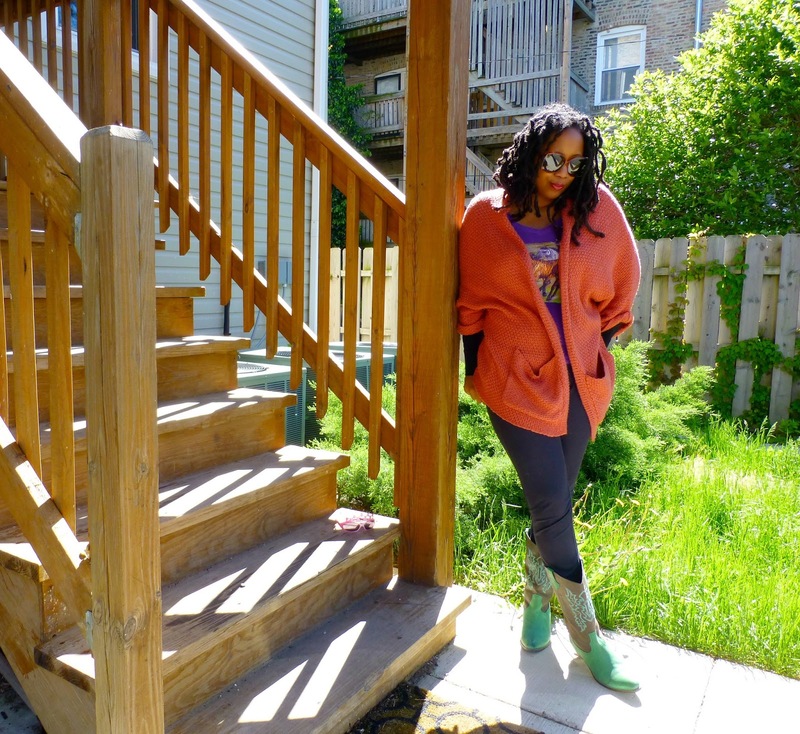 Comfortable and casual non-frump dressing can be hard. 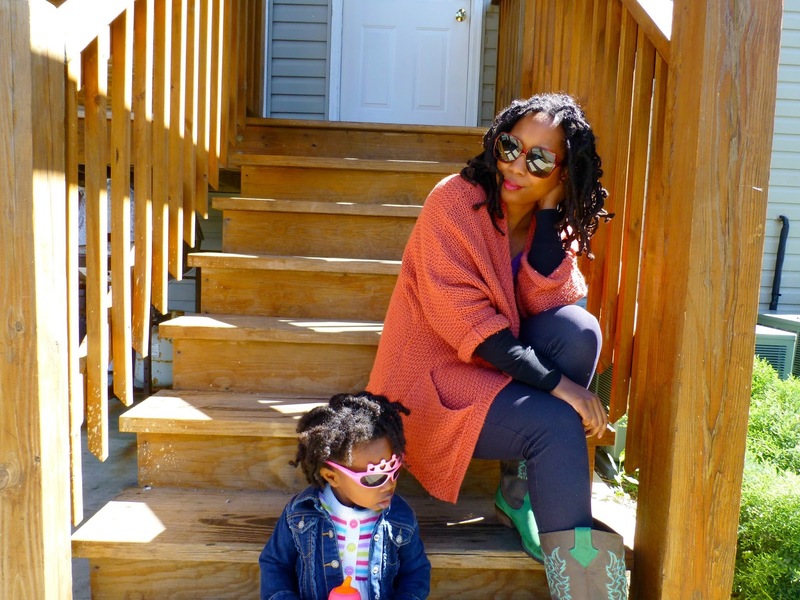 What's your stay at home mom casual style? In other news, have you checked out the gorgeous vintage clutch and other goodies I'm giving away? Still lovin' those boots! A maxi is my go to comfy mom look! You always make me lol about your cowboy boots! You look cosy in your casual look! Mine is usually my maxi dress or cape style dresses. Cute outfit! Don't think I could pull off cowboy boots. I just discovered that I love the way I look in skinny jeans. I love jeans,t-shirts,flipflops. I want some of those skechers wedge type flats. Right now I have generic family dollar converse. That sweater is my absolute favorite! 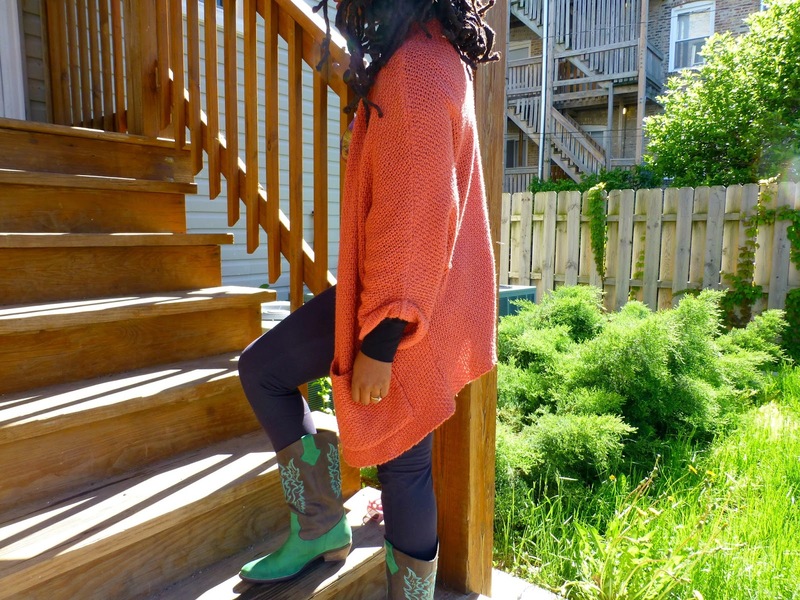 Love the boots, sweater.. The whole deal! It's also still cold in Minneapolis, so I've been rocking leggings since October 2012- which irritates me at the end of May! My outfits are similar to yours, but you look much more pulled together! You have a casual cool SAHM style! It looks like you make an effort and stay true to your personal style! Love the sweater n the boots n d whole look is so chic. My fav item r my tory Burch espadrilles n my colorful wrap sweater.